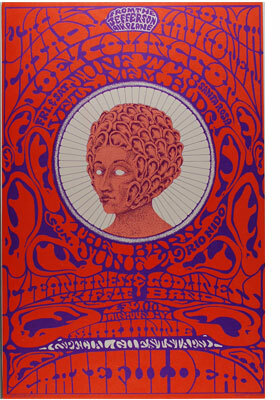 1960's Concert Posters Deluge Mainstream Media! This past week saw the appearance of two major news stories and one motion picture about classic 1960's rock concert posters. All of this reinforces what our clients have known for a very long time, that this is a collectibles market that is currently enjoying unprecedented exposure and popularity. Demand currently far exceeds the available supply of the most desirable material and this is resulting in rising prices. Please contact us today and we'll tell you how you can best take advantage of the single most lucrative collectibles opportunity we've seen in the past 30 years! The first story to hit was about the new exhibit at The Denver Art Museum titled "The Psychedelic Experience." Below are three great links that give you all the details on this exciting event! The second major story appeared on the front page of U.S.A. Today's Life section about a new exhibit at The Museum at Bethel Woods that commemorates the 40th anniversary of Woodstock. Lastly, news arrived about a full length motion picture titled "American Artifact, The Rise of American Rock Poster Art" which is currently in production! Be sure to subscribe to our RSS feed so you can stay informed about this fast moving market!